Info "Using your sword, stand up to the fruit thief and get your fruit back! And beware the most evil of all villains: the vegetable bandit!" Produce Stand-Off is Penny's Boss Microgame in WarioWare: Smooth Moves. The player will engage in a sword fight with the fruit bandit. The player must defend against the opponent's moves by parrying the other sword, which is accomplished by moving the sword either left, right, or upwards. When a certain number of moves is finished, the player will be prompted to thrust forward and slash the opponent's helmet. 1st level difficulty: The enemy will be a Banana Bandit. 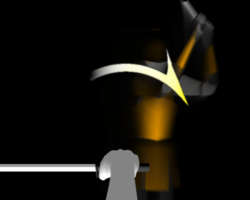 The player will generally be guided to which position to move the sword to, and the enemy's movements are easy to parry. 2nd level difficulty: The enemy will be a Strawberry Bandit. The enemy's movements are more unpredictable and harder to parry against. 3rd level difficulty: The enemy will be a Blueberry Bandit. The enemy's movements are tricky. This page was last edited on April 23, 2018, at 00:36.